LARM surveys womens activities in sound art through the publication of LARM From mouth cavity to laptop: the sound of Nordic art. The book presents a selection from the rich material of the LARM inquiry, exhibiting sound art from different perspectives in thematic texts and presentations of artists. Accompanying the book are two CD:s with 24 tracks spanning 60 years of new and previously not published material along with well known tracks. The texts in the book are in the Nordic languages with english translations. Since 1999 Barrett has worked as a freelance composer and performer of acousmatic and live electroacoustic music. Her work has a strong relation to spatiality, often performed as concert-installations. She also researches and writes on sound. Barret writes on spatial composition and three-dimensional sound for the LARM-book. Member of the LARM group. Bjurestams artistic work are in the areas of space, the body and language. In 1995 she ran The TELEPHONE Gallery  art on an answering machine  with Malin Lobell. Teaches since 2006 at the Academy of Fine Arts, Umeå University. Bjurestam interviews french/finnish artist Marianne Decoster-Taivalkoski about her interactive sound-installation Aquatic. Ina Blom is an art critic, curator and art historian. Her articles and books deal with subjects such as dada/neodada, the media technologies of the avant-garde and the ambivalent politics of Joseph Beuys. In the 1980s and early '90s Ina Blom was a music critic and DJ. She has been an art critic for Aftenposten and co-editor of Siksi and NU, and is a contributor to various art publications, including Frieze, Parkett, Afterall and Flash Art, as well as to numerous books and catalogues on contemporary art. Ina Blom writes about voice-equilibrist and performer Lisa Dillan. Catharina Dyrssen is an architect och musicologist as well as a doctor of engineering, senior lecturer an leader of the master- and researchprograms at the department of Architecture at Chalmers university of technology in Gothenburg, Sweden. She is intresed in interdisciplinary project and has written a thesis on architecture, music and anthropology. Her text discusses aspects of sound and spaces. Nina Björk Elíasson, an Icelandic folk-singer from the beginning, has explored the voice as an instrument using phonetics, human sounds, different vocal qualities and feelings. She is a member of different groups as an experimental vocalist. Eliasson writes about the voice as an instrument. well as she exhibits, performs and acts. Gustafsson writes articles in different magazines and has published the book female bonding, 2003. Johanna Gustafsson interviews Katrin von Rettig about DK, an artists collective who made music, performance and managed an alternative art gallery in Stockholm in the 1980s. Zeenath Hasan is an independent media designer involved in the practice of design for development. She explores the potential of mobile information and communication technologies to facilitate grassroots activities and networks by mediating between technology actors, interest groups and the working team. Hasan writes about her research and her projects IMPROVe and MAHITI. Mika Hannula has a PhD in Political Science and lives and works in Helsinki and Berlin as a curator, teacher and art critic. Since 2000 he is the director of the Helsinki Academy of Fine Arts. Hannula is the author of numerous articles on contemporary art and of several books. He also nourishes a great interest in music . For the LARM-book he writes on the finnish improvisational groups Hertta Lussu Ässä and Kukkiva Poliisi. Stine Hebert is an Art Historian with a MA from Goldsmiths College, London on sound. Hebert has worked as an assistant curator at the ARKEN Museum for Moderne Kunst and co-curator at the AUXs international sound art exhibition Technical Breakdown. She writes on sound art and has recently finished a long term project with Jacob Kirkegaard (www.fonik.dk). For LARM, Hebert writes on the work of artist Ursula Nistrup. Meena Kaunisto is a writer, journalist and freelance producer. She has been working with a range of theaters in Finland, as a producer for film- and theater festivals and for the international projects of "Helsingfors Cultural City 2000". Meena Kaunisto also worked as a producer for documantary films in Africa and France. She contributes with a text on Päivi Takala, musician, composer, film-maker and teacher. Kira Kira, Kristín Björk Kristjánsdóttir, is a founding member of Icelandic art collective Kitchen Motors. She has composed music for theatre, dance and movies and performed and exhibited in various places in the world. In the LARM-book she discusses the sound art scene in Iceland, together with Thor Magnusson and LARM. Magnusson is an Icelandic writer, musician and artist/programmer who writes his own musical software. After having studied music, philosophy and cultural studies in Europe, he graduated in Electronic Arts from the Lansdown Centre for Electronic Arts in London. Since then he has been working in sound-related programming in various projects, as the ixi software project where he, Enrike Hurtado and others are experimenting with creating alternative interfaces for musical composition. 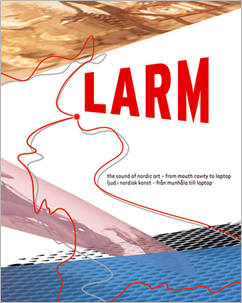 In the LARM-book he discusses the sound art scene in Iceland, together with Kristín Björk Kristjánsdóttir and LARM. Grethe Melby is an honours degree student at the Institute of Media Science at the University of Bergen. She has participated in several minor Norwegian Internet art projects and written a number of articles about Internet art. Melby has also worked as a theatre producer and actor. For LARM, Melby writes about artist Maia Urstad. Thomas Millroth an art historian and director of Museum of Art in Ystad, Sweden. He is a writer and art critic, and has published a large number of books, reviews and articles on art. He also curates major exhibitions and sound-art festivals. Millroth contributes with a survey on Swedish sound art. Composer- Performer and founder of Deep Listening. Pauline Oliveros' life as a composer, performer and humanitarian is about opening her own and others' sensibilities it the many facets of sound. Since the 1960's she has influenced American Music profoundly through her work with improvisation, meditation, electronic music, myth and ritual. Many credit her with being the founder of present day meditative music. All of Oliveros' work emphasizes musicianship, attention strategies, and improvisational skills. LARM publishes an excerpt from a text on Deep Listening. Adina Popescu is an independent writer and curator, writing for Flashart, Contemporary, Monopol, C-Magazine, among others. She also contributed to catalogues for Hamburger Bahnhof (Berlin), MCA Reykjavik and the Sydney Biennale. For LARM, Popescu writes on interviews as sound-art. Bodil Persson is a teacher, writer and dramaturgist, active at the University College of Dance University College of Film, Radio, Television and Theatre in Stockholm and the Swedish Radio. She has a background in theatre as a director and motion pedagogue. Her text looks on sound generated by bodies and movements in dance. Elisabet Indra Ragnarsdottir is a musicologist and program producer at the Icelandic Radio where she is the editor of the daily music program Hlaupanotan (www.ruv.is/hlaupanotan). She writes about the composer and flutist Thurídur Jonsdottir. One of the initiators of LARM. Liv Strand works artistically in various techniques and materials, for example with mechanical sculpture where sound is a product of movements, with sound installations and radio programs. Her art often has a spatial aspect. Liv Strand interviews Else Marie Pade, Danish pioneer in electroacoustic music.